Su-35S demonstrator with exposed Irbis-E phased array. 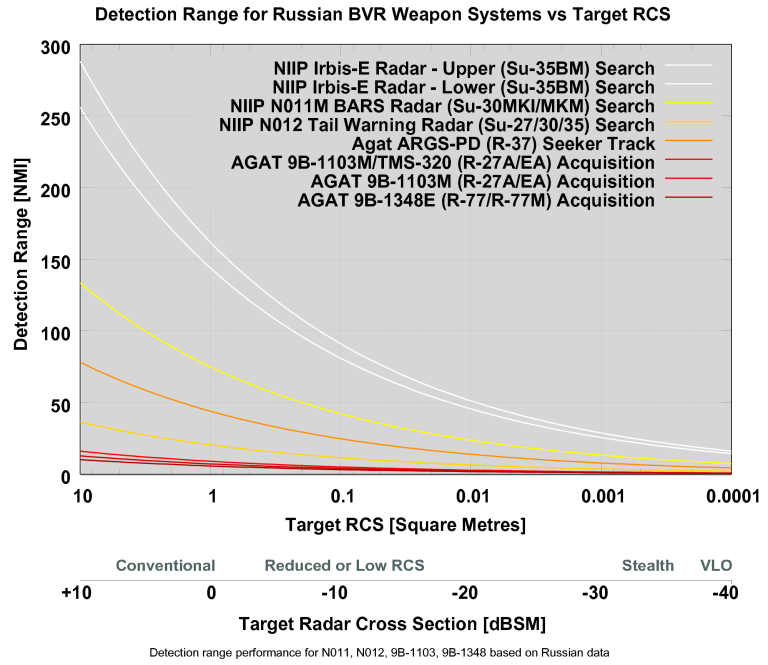 The now well established trend in Russian sensors for BVR combat is increasing range performance and countermeasures resistance. The 20 kiloWatt peak power class Irbis E ESA radar is the most powerful in its class. (KnAAPO). 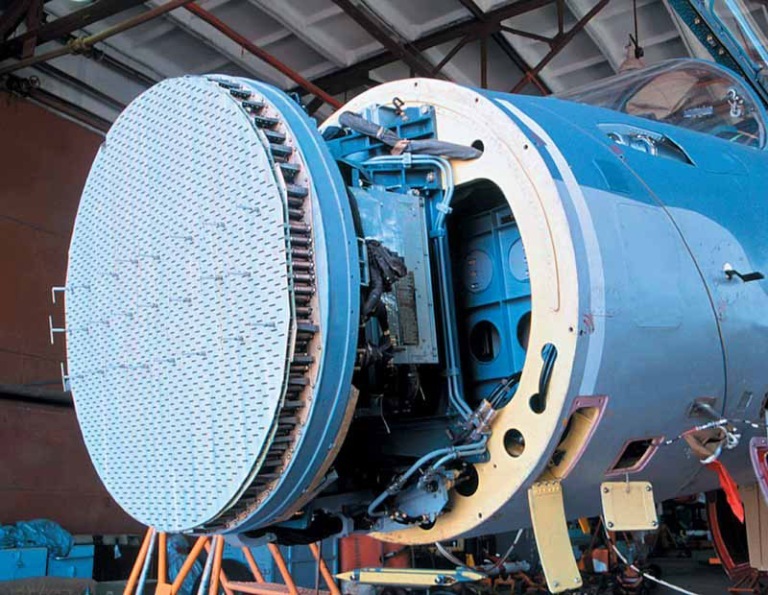 Russia's military radar industry has advanced considerably since the end of the Cold War, largely resulting from access to Western technologies in the global market. This has seen significant advances in basic technology, especially in such key areas such as radar signal processing, radar data processing, embedded software, Gallium Arsenide semiconductors for low noise receivers, and in HEMT (High Electron Mobility Transistor) transistors used in Active Electronically Steered Arrays (AESA). This sustained growth in basic technology has been reflected in ongoing growth in the capabilities of the various radars deployed in Russian Air Force and export variants of the Sukhoi Flanker fighter. This analysis will survey the basic radar types available, summarise the data, and include a cardinal parametric analysis. Representative Western radar performance will be compared, with a focus on Beyond Visual Range air combat regimes of operation. Pulse Doppler radars remain the primary long range sensors used by fighter aircraft for BVR combat. This is for several good reasons. Infrared sensors cannot penetrate cloud or other atmospheric propagation impairments as well as X-band microwaves can. Radar, conversely, can penetrate most weather conditions and impairments from the stratosphere down to the lowest layers of the troposphere. Effective range is another consideration, as radar performance is limited by the pulsed power-aperture product of the design, which in the current state of the art permits X-band fighter radars to acquire larger targets at distances in excess of 200 nautical miles (~400 km). Radars are also capable of rapidly divining the velocity, direction, altitude and often identity of targets, which can be problematic for passive sensors operating in the optical bands. Radars typically also double up as X-band datalink transmitters for long range missiles, an important factor in achieving high kill probabilities in BVR combat, where the time of flight of the missile would otherwise create opportunities for a target to move outside of the No Escape Zone (NEZ) of a BVR missile seeker. For the forseeable future radars will remain the primary tool for the acquisition, tracking, and engagement of targets in the BVR air combat game. The design parameters of most interest to analysts and competing radar designers in this area are those which determine the ultimate limits on the detection range of the radar against representative airborne target types at long ranges. These are all contained in the most basic forms of the radar range equation, and the physics of radar performance it describes. Peak Power (Ppeak) [kW] is the maximum pulsed power the radar can emit. It is limited mostly by the transmitter technology employed, and to a lesser extent, the antenna design. In general, the higher the peak power emitted, to the first order, the better from a range perspective. Peak power is also important in Electronic Warfare terms as it determines the burnthough performance of the radar, or the point at which the energy reflected by a target is greater than the energy produced by the target's defensive jamming equipment. This the point where jamming effectively fails. Aperture Gain (G) [-] is a measure of the area and efficiency of the antenna employed for transmission and reception. The bigger the aperture gain in a radar, to the first order, the better from a range perspective. 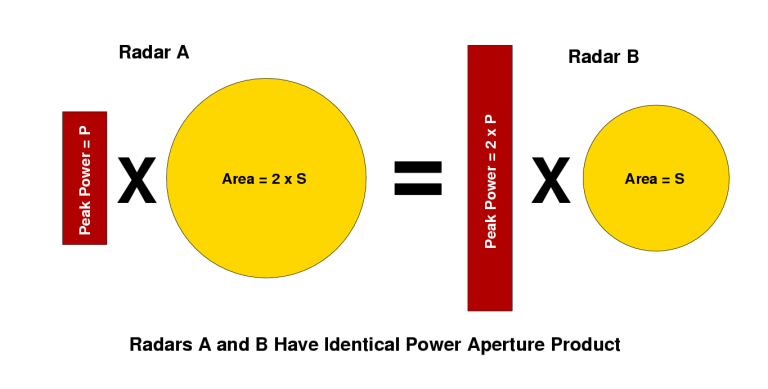 Power Aperture Product (PA or PxA) [Wm2, dBWm2, dBW] in its most commonly used form is calculated by multiplying Peak (or Average) Power x Antenna Area (or Power [dBW] + Antenna Gain [dB] in [dBW]). It is a parameter used by designers to gauge the relative performance of different radar designs. To the first order, the radar with the higher Power Aperture Product or PA will achieve better range, detection and jammer burnthrough performance. Receiver Noise Figure [-] is a measure of the thermal and shot noise effects which are competing in the radar receiver with intended signals to be received. The lower the noise figure (or 'noise temperature'), the better. Receiver noise figures are generally similar for given generations of radar technology, reflecting the radio frequency transistor types, and antenna configurations used. In practical terms, to maximise detection range and jammer burnthrough performance, the biggest radars in terms of power and antenna size win over those with smaller antennas and less power. Leaving detection and tracking range performance aside for a moment, other radar parameters and attributes are also relevant in a combat environment. Unfortunately these capabilities and parameters are often not so easy to compare parametrically, and in many situations are less important than the range and burnthrough performance. Sidelobe Performance [deciBels] of a radar antenna determines how much energy is emitted in directions other than than intended, and how much energy is detected from directions other than intended. Sidelobe performance is important in rejecting ground clutter when pursuing low altitude targets, and in providing good resistance to jamming. Jammers are often designed to inject false targets into a victim radar via its sidelobes. Mainlobe Width [degrees of arc] of a radar antenna determines how narrow the main lobe of the antenna radiation pattern is, or in simpler language, how narrow a 'pencil-beam' of microwave energy the radar produces. As the so called 'antenna reciprocity theorem' applies, for a typical antenna design the mainlobe (and sidelobe) parameters are the same for transmitting as they are for receiving. For typical fighter radars, mainlobe widths vary between 4° and 2° of arc. For many applications, the narrower the beam the better, within limits. Antenna/Receiver/Transmitter Bandwidth is a measure of the radar's potential frequency agility, or its ability to hop across frequencies to evade detection and jamming. Bandwidth is also important for many modes which require wide bandwidth modulations in the signal. These include Low Probability of Intercept (LPI) modes, High Power Jam (HPJ) and high speed datalinking (HSDL) modes. Signal Processing Performance is a measure of how many computations the radar signal processor can perform per second on the digitised raw radar video signals collected by a receiver. This parameter is often measured in terms of Fast Fourier Transform operations executed per second, or where performance is considered sensitive, in the less revealing measures of MIPS (millions of instructions per second). Signal processing performance will impact the radar's ability to sift targets from noise, jamming and low altitude clutter. A related parameter is the number of receiver channels employed. In digital radars these are usually paired. Again, a larger number of channels is typically better. Data Processing Performance is a measure of how many computations the radar signal processor can perform per second on the target track data collected by the radar, as well as on computations associated with missile guidance and envelope management. Data processing performance will impact the radar's ability to track large numbers of targets, manage multiple missile engagements, control multiple missiles in flight, and perform other functions important to the managment of the radar's operation. Beamsteering Agility is a measure of how quickly the antenna mainlobe can be pointed in a different direction, and/or reshaped for a different operating mode. In MSA (Mechanically Steered Antenna) designs this parameter is typically of the order of hundreds of milliseconds. In AESA/ESA (Active / Electronically Steered Antenna) designs this parameter is typically of the order of hundreds of microseconds, or a thousand times faster. Beamsteering agility is important in tracking targets, multitasking the radar between diverse operating modes, providing resistance to jamming, and supporting multiple concurrent missile shots. Angle Tracking Technique is the method used by the radar to measure the angular position of a target within the radar's mainlobe. The favoured technique in recent decades is monopulse angle tracking, due to its accuracy and resistance to many jamming techniques. Monopulse angle tracking can use multilobed techniques, or sequential lobing techniques. Given the complexity of radar equipment internally, and from a design perspective, there are many other parameters which define the overall capabilities of a radar and its performance across the wide range of modes in which modern multifunction radars are used. However, in long range missile engagements, to the first order of magnitude, the Power Aperture Product is the critical parameter. Over its long production history a wide range of radar types and subtypes have been fitted to variants of the Sukhoi Flanker fighter. Whilst some observers like to generalise the term 'Flanker radar' it is not unlike saying 'Pentium PC' - the range of power aperture product performance seen across these radars is greater than in any other tier one combat aircraft. A detailed analysis of each of the main radar types used is provided in the latter part of this paper. There are four primary and distinct types of radar carried by Flankers, each with distinct subtypes or block upgrade levels. In regional terms, variants of the baseline N001 series are most commonly seen, with the vastly more capable N011M BARS phased array now also well established in the region. Russian specifications almost uniformly assume a 4:1 (25%) duty cycle between average and peak power ratings. All later antenna apertures are 0.9 meter diameter thus contributing significantly to power aperture product. Public specs claim 34 to 36 dB gain for most variants, parametric analysis suggests up to 39 dB gain. Area is ~0.64 square metres (0.87 for Pero). In the interests of analytical robustness, this paper uses the 'raw' form of the peak/average power aperture product (raw power x area [dBWm2]) as this is less vulnerable to incremental design changes in antennas, feeds, and transmitters, than the alternate form (power x gain [dBW]. As such the 'raw' form is a better indicator of the ultimate performance potential of a given antenna / transmitter configuration. An example of where the latter form [dBW] gets into difficulties is in different specifications of antenna gain, including or excluding feed losses, or situations where an incremental design change to a feed or antenna removes several dB of loss previously listed. Different clients are often supplied with different TWT ratings on a given radar type. 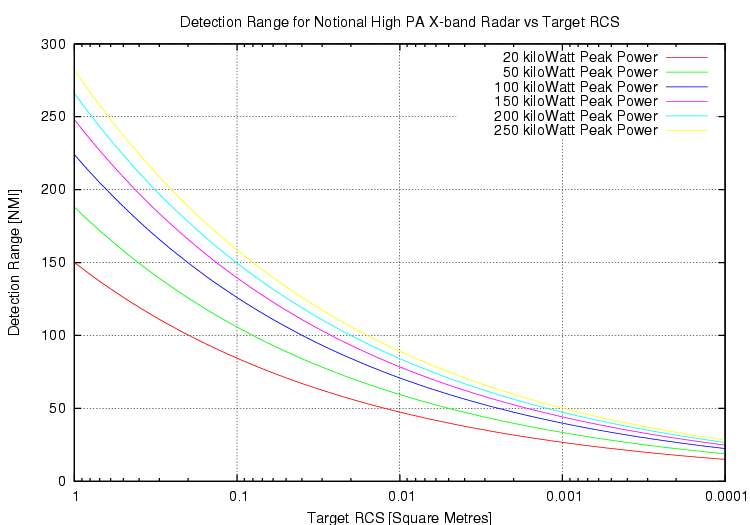 Detection range performance figures for many older radar variants are not specified in terms of a target Radar Cross Section [RCS] and are thus difficult to objectively assess. Usually the Russians refer to a 'fighter sized target' for such figures, with an assumed RCS of 3 to 5 m2. The much better Noise Figure (NF) performance in the BARS and Irbis is a result of the hybrid array design employed. What is clear from available data published by Russian manufacturers over the last fifteen years is that the Flanker has seen a roughly fivefold growth in the power aperture product performance of available radar designs. In practical terms, this amounts to a gross increase in detection range performance of around 50 percent since the N001 was first deployed, and a gross increase in jammer burnthrough performance of around 120 percent. Improvements in processing and antenna/receiver design make the actual performance improvements better. A good comparison is the APG-71 radar in the F-14D Super Tomcat, which falls in between the N011M and Irbis E in raw power-aperture product performance (above). 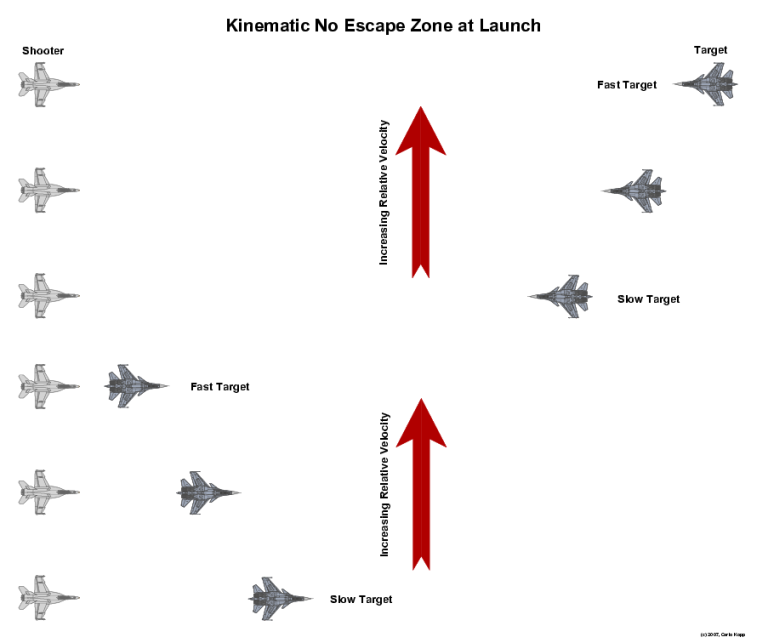 Assessing late model Flanker radar range and burnthrough performance by using the baseline N001 and its variants as a benchmark is therefore a complete folly. It is akin to using 1980s US fighter radars as a benchmark for assessing the capability of current US production fighter radars. From a strategy and force structure planning perspective, the N001 and its variants are now of marginal relevance, as the more capable and newer radars will progressively displace them in the marketplace and thus in deployed force structures. Very few serious Flanker users will retain N001 variants over the coming decade as they are no longer competitive against newer NIIP offerings, or the AESA technology now being deployed by the US and its allies . The player with the longer ranging radar has a longer ranging missile to facilitate a first shot. The player with the shorter ranging radar does not have the capability to effectively jam the radar. The victim does not turn tail early, spoiling the missile engagement geometry and getting out of the missile's kinematic No Escape Zone. Missile kinematic performance is thus critical, and a prerequisite if one seeks to gain an advantage by deploying a longer ranging radar than an opponent has. Missile range will be determined in part by the design of the missile, specifically how much energy is stored in its rocket or ramjet propellant, and how good the midcourse autopilot software is in converting that energy into range, but the kinematics of the launch aircraft also matter immensely. The F-22A has proven repeatedly that supercruising at 50,000 ft adds more than 30 percent to the range of the AIM-120C AMRAAM it carries, compared to a subsonic launch from a conventional teen series fighter. The Russian drive to improve supersonic persistence in the Flanker via supercruise class engines is clearly in a large part driven by this reality. In the bluntest of terms, throwing a spear from the top of a hill is always easier than throwing one uphill. An R-27EA with a range cited at ~70 nautical miles becomes a ~100 nautical mile class missile if launched supersonic from a superior altitude. Electronic warfare between opponents remains a key consideration in long range missile combat. While high power aperture radars provide good burnthrough performance, at extreme ranges well in excess of 50 nautical miles burnthrough is unlikely to be a practical proposition. This is because the power ratings of conventional defensive jamming systems will be sized to defeat surface based engagement radars with power aperture performance well in excess of any fighter radar. A technique for suppressing a jamming source that is available to users of AESAs and hybrid ESAs is to put sharp nulls into the antenna mainlobe dynamically. The use of the ESA or AESA to jam an opponent's radar is a proposition only where the opponent lacks the frequency agility in the their radar to evade jamming, and lacks an X-band anti-radiation missile which would benefit from the stable emissions produced by a jamming mode. What does become a proposition for both sides is jamming of the missile midcourse datalink uplink channel to deny midcourse flight position updates after a missile launch. Historically the jamming of missile uplinks has been considered difficult and demanding of high power levels. This is because missile datalink antennas point in the direction of the launching aircraft, which means that what little jamming power can couple into the antenna must be carried by surface travelling waves along the missile airframe. With a high power aperture ESA or AESA such uplink jamming becomes feasible. However, both sides also have the option of coating their missiles with X-band lossy materials, which will diminish the coupling effect. The reality for better or worse is that possessing radar detection and tracking range performance well in excess of missile kinematic range performance is unlikely to provide any benefit beyond very early warning of an inbound threat, giving the pilot the option of reversing and getting away, provided the opponent's radar and radio frequency surveillance systems are not good enough to detect the longer ranging radar. Increased fighter power aperture performance may increase its target detection footprint, but it also increases the opponent's passive detection footprint for the radar - the inverse square law of passive detection produces stronger effect than the inverse fourth power law of radar detection. The latter phase of the Cold War saw an ongoing contest between US and Soviet designers to deliver the longest ranging multimode radars for BVR combat in intensive jamming environments. The Soviets led during the 1960s with the massive RP-25 Smerch on the MiG-25 Foxbat. The US then gained a lead during the early 1970s with the F-14A's AN/AWG-9 radar, originally developed for the navalised F-111B, and the F-15A's APG-63 radar. 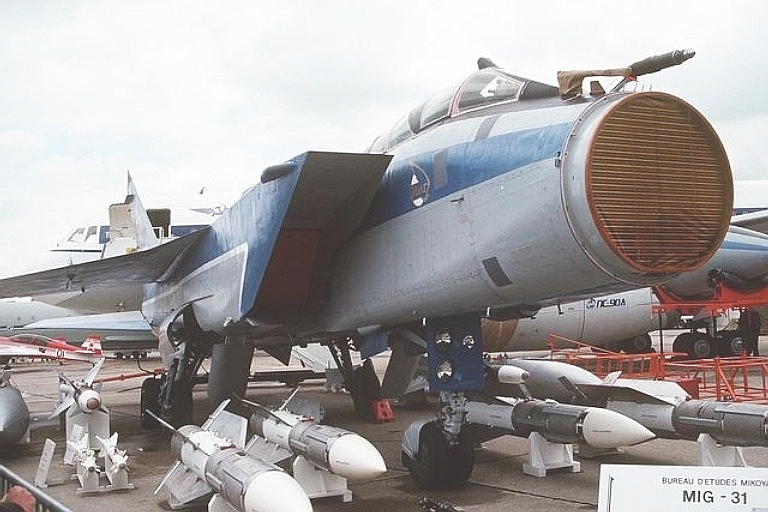 The Russian's snatched the leading position back with the early 1980s N007 Zaslon on the MiG-31 Foxhound, a massive phased array design twice the size of the US AWG-9 radar. Rated at 2.5 kiloWatts average power, with a 25% duty cycle peak power rating of 10 kiloWatts, this immense radar is claimed to be capable of detecting a 0.3 m2 RCS cruise missile at 35 nautical miles range. NIIP's enormous N007 Zaslon on the MiG-31 was the highest power-aperture fighter radar to emerge during the last decade of the Cold War. If was specifically built to hunt cruise missiles, and is claimed to be able to detect a 0.3 m2 RCS cruise missile at 35 nautical miles range. The advent of the Flanker saw the introduction of the N001 radar, intended to match the US APG-63. While the radar did not meet expectations, it is the baseline of the Su-30K radar flown by the Indians in the Cope India 2004 exercise in which late model APG-63 equipped F-15Cs were defeated in simulated BVR combat. By the time of Cope India, Russian industry was delivering the first production examples of the NIIP N011M BARS hybrid ESA on early Indian AF Su-30MKI Flankers. Until recently the BARS was the highest performing radar on any fighter other than the F-22A - while the AWG-9/APG-71 has marginally better power aperture performance, the hybrid array design of the BARS gives it around 6 dB better sensitivity. The next major advance in the state of the art was the F-22A's APG-77 radar, designed for low observability, with the highest (and to date still undisclosed) power aperture rating of any fighter radar. It remains the benchmark in this technology, a large 1500 element AESA design. With the APG-77 setting the technological trend, the US industry developed over the last decade a number of AESA upgrades and new designs. The APG-79 is the F/A-18E/F Block II radar, originally intended for all Hornet subtypes but only integrated on the Super Hornet due to its cooling demands. The APG-80 is the F-16/B60 AESA. The APG-63(V)2 is a first generation AESA upgrade to the F-15C, the APG-63(V)3 being a second generation design based on module technology common to the APG-79. The APG-81 is the F-35 Joint Strike Fighter AESA, which uses later generation modules than the earliest APG-77 variant. The current production F-22A/B20 APG-77(V)2 uses common module technology to the APG-81, but delivers considerably more power due to the larger module count and greater cooling capacity of the airframe. The US had a major technology breakthrough in AESA design around a half decade ago when Gallium Nitride (GaN) HEMT (High Electron Mobility Transistor) X-band transistors were perfected, allowing considerably more output power than earlier Gallium Arsenide transistors. This has created an effect not unlike euphoria in some parts of the US defence industry, and a worldwide drive by global semiconductor houses to occupy the market. 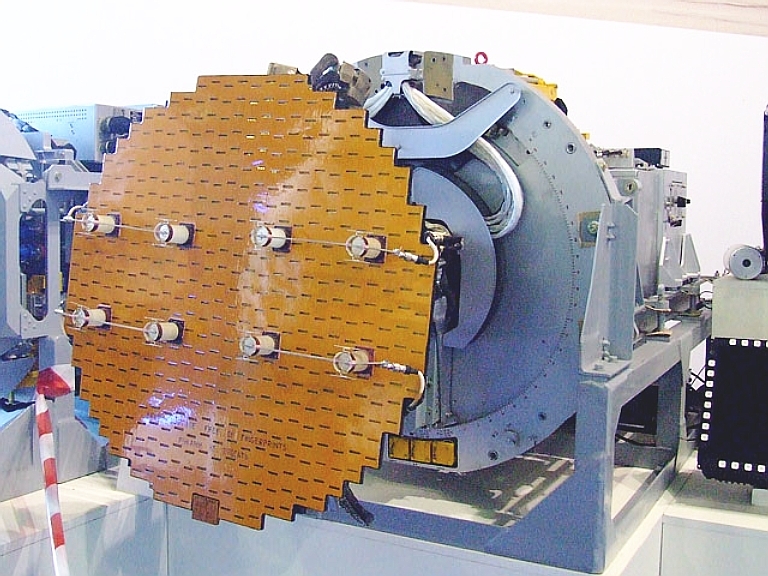 Historically AESA performance was limited by the power output per module at X-band, typically of the order of 2 to 5 Watts per module. The GaN transistor technology appears at this stage to be capable of delivering ten times the power per module, which changes the problem AESA designers face from barely getting viable power output, to not having enough cooling and electrical power capacity to cope with the transistor technology available. A good example is the Toshiba TGI8596-50 GaN HEMT announced July, 2007, capable of delivering 50 Watts in the X-band and targeted at radar and microwave communications equipment. The long term implications of the Gallium Nitride breakthrough in X-band microwave transistor technology are most interesting. If AESA designers are not significantly limited by basic technology in the microwave power they can extract from each AESA module, then radar power aperture performance will grow until it hits the limits of the power generation and especially cooling capacity of an airframe. Consider a radar design with 1500 modules, and the availability of modules capable of, if powered and cooled adequately, transmitting 40 Watts of continuous wave X-band microwave power, with an efficiency of 50 percent (PAE=50%). The sustained peak power such an AESA could produce is of the order of 60 kiloWatts. If we assume the Gallium Nitride transistors are capable of sustaining 160 Watts each this power rating can be quadrupled to PPEAK=240 kiloWatts. For comparison X-band GaN/SiC transistors rated at 80 Watts have already been reported in the research literature. With an aperture area of about 0.65 m2 this yields a power aperture product of the order of 51.9 dBW or a relative range increase compared to contemporary top end 20 kiloWatt class fighter radars of around 150 percent. The utility of this range increase may be irrelevant considering conventional targets, but where it matters is in providing the ability to detect stealthy targets at very good ranges. The following chart depicts the impact of a notional very high power aperture radar on detection ranges for stealthy targets. What is clear is that X-band fighter radars with peak power ratings well above 20 kiloWatts have the potential to render all but top end stealth technology ineffective. While engineering such radars would present serious challenges, some arguably extremely difficult to resolve with a sub one metre aperture diameter, and possibly forcing very low operating duty cycles, it is abundantly clear that the trend will be to strive for the highest power aperture product achievable, as the incentives are very powerful. In this game the primary constraints then become the cooling of the array and dumping of waste heat out of the aircraft. Larger aircraft do much better with these constraints, compared to smaller aircraft. 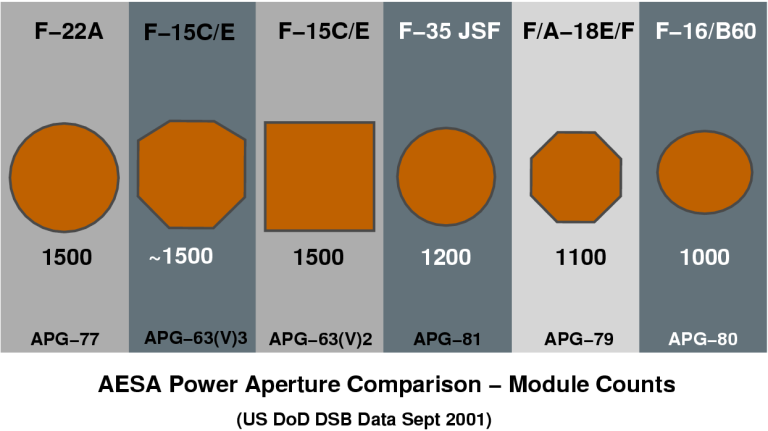 In the long term contest for higher power aperture product, fighters like the F-35 JSF, F/A-18E/F, F-16 cannot compete with aircraft in the size and volume class of the F-15, Flanker or F-22A. The defining characteristics for best survivability will be the size to effectively power and cool the highest power aperture product radar which can be fitted, and the best X-band all aspect stealth performance. The potential of X-band fighter radars with power ratings in excess of 20 kiloWatts to be used as Directed Energy Weapons (DEW) is an issue in its own right . Raytheon APG-79 AESA (US Navy image). 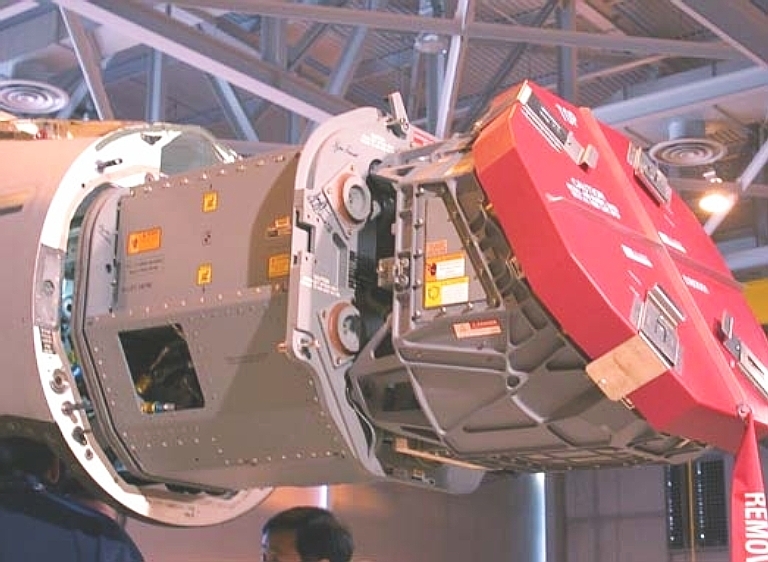 Of the current generation of US AESA radars, the only one which is well technically documented in the open literature is the APG-79, which will therefore be used as a baseline for comparison against the Flanker radars. The APG-79 was initially sold as a block upgrade to the legacy APG-73, itself an incremental upgrade to the APG-65. The APG-79 however ended up being much more than a simple block upgrade, adding not only a powerful AESA, but including additional processing capability and tight integration with the ALR-67 radar warning and emitter locating system, and requiring forward fuselage changes to the aircraft. One of the key design considerations was to improve the capability to detect and engage anti-shipping cruise missiles, a major problem for the US Navy Carrier Battle Groups. Given the relatively modest footprint to be defended, the poor supersonic performance and payload range of the Super Hornet was less important than the ability to lift an X-band radar above the horizon of the shipboard defences. There is enough unclassified data available at this time to perform a reasonable estimation of performance bounds on this radar, with the caveat that evolving transistor technology over the life cycle of the design will see shifts in performance. 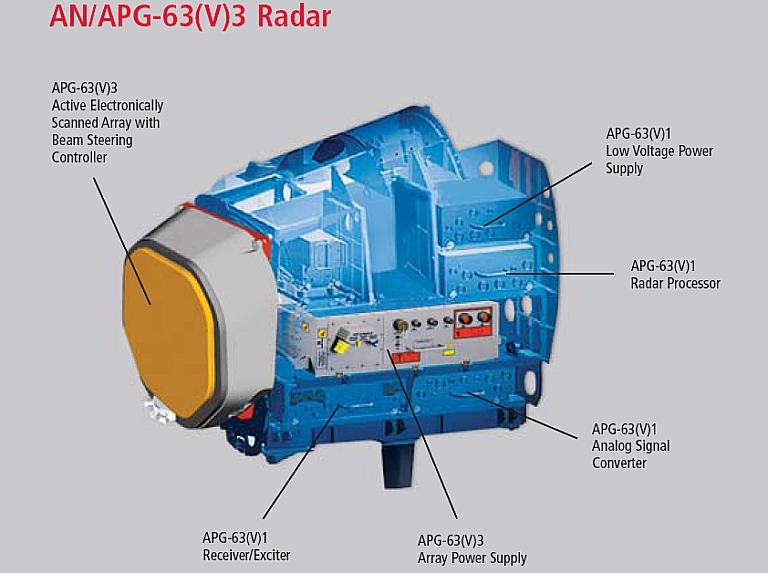 The radar is known to have ~1100 modules, which assuming like per module power rating, cooling and X-band wavelength would result in around 70 percent of the power rating of the APG-77. This puts the radar broadly between 10 kW and 20 kW peak power ratings. Public data comparing the APG-71, APG-73 and APG-79 yields an indication that the radar has similar power aperture product performance to the 10 kW rated APG-71, which for half the antenna area yields a peak power rating of the order of 20 kW. This data supports the proposition that the radar is a 20 kW peak power class design. In general, the peak power rating of an AESA is determined by the per module power rating multiplied by the number of elements, with some reduction resulting from the taper function which is used to weight power output per module, so that sidelobes and mainlobe shape can be optimised. A 20 kW peak power AESA with a 15% allowance for taper function yields for instance a per module rating, for 1100 modules, of around 21 Watts. The average power output of the radar is then limited by the duty cycle of operation, and power consumption overheads incurred by drivers, and phase and control elements in the modules. The latest engineering literature on AESAs puts the state of the art for radiated X-band power intensity at about 4 Watts/cm2 which for the X-band is around 16 Watts/module. This would put the total peak power at about 17.6 kW. 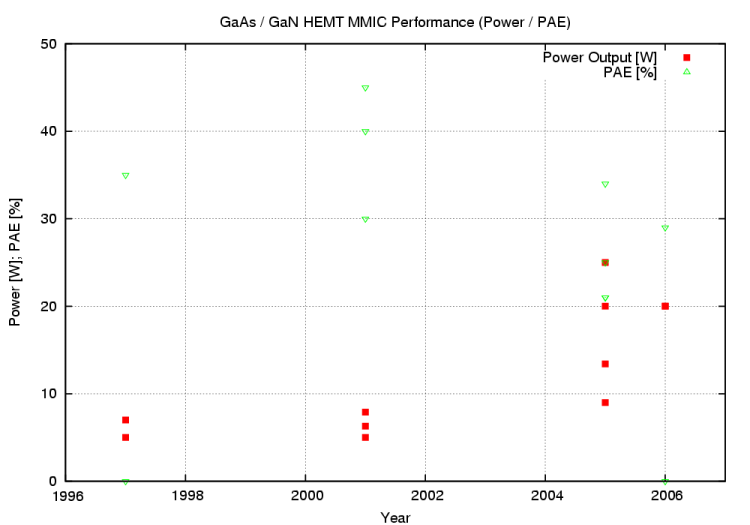 This chart shows a sampling of performance figures from recent research papers for GaAs and GaN technology Monolithic Microwave Integrated Circuit (MMIC) High Power Amplifiers (HPA) operating at X-band frequencies. Such devices are the primary power stage in an AESA Transmit-Receive module. GaN HEMT technology has driven up recent power ratings to better than 20 Watts, but efficiencies remain problematic, mostly below 40%. Prior to the advent of the GaN HEMT, the conventional wisdom about AESAs was “AESAs are great for high average power but not so great for peak power”, reflecting limited per transistor power ratings. Clearly the state of the art currently permits a 20 Watt module, using either ganged HEMTs of lower power, or single GaN HEMTs delivering all of the power, the principal question then being whether the PAE (efficiency) is at the high or low end of the scale. These estimates can be further constrained by applying some understanding of basic AESA design principles, and constraints such as the publicly disclosed cooling demand of the AESA antenna section, which dominates the PAO liquid cooling loop load. Very little modelling is required to relate the waste heat dissipation to cardinal performance parameters of the HEMT power transistors, and factors such as typical transmit duty cycles . However, accuracy of estimation depends on the assumed mode in which the HEMTs in the TR modules are operated. Are they running in static A-class operation, or are they running in pulsed or gated A-class mode, where the transistors when idle are biased down to a low power consumption mode? Another question is how many Watts of power can be effectively extracted from each module by the cooling system? Another consideration is the total duty cycle of the radar, or the percentage of time it is transmitting - while individual modes may occupy up to 25% duty cycle each, interleaving multiple modes will drive up the duty cycle considerably, in turn driving up average power dissipation. A further consideration is what static thermal load may be incurred by other components of the radar, such as processors, if these are liquid cooled half a kiloWatt or more may be required to cool a full cardcage of VMEbus COTS processors. Modelling this, assuming 0.5 kW for non-AESA heat load, a 20% power overhead for the AESA internal support circuits and backplane driver amplifiers, and a per module efficiency between 25% and 45% shows that peak power ratings of the order of 20 kW are feasible at duty cycles of the order of 50%, with acceptable cooling margin. The available data and modelling thus easily supports the proposition that the APG-79 is a 20 kW peak power class radar, with the caveat that better performance is theoretically achievable, as is lower performance given the technology available. With around one half the aperture area of the BARS and Irbis E radars, the resulting order of magnitude power aperture product of 38 dBWm2 puts the radar almost exactly in between the two Russian designs. If we are generous with assumptions and consider growth potential, then it might be rated a little closer to the Irbis E.
It is also worth asking the question of what peak power rating the APG-79 would require to match the 40.8 dBWm2 power aperture product of the Irbis E, given that its aperture is around half the area of the Flanker radar. The result is a considerable 35 kW - reflecting the reality that half the antenna size requires twice the peak power to match a power aperture figure. Is such performance feasible? The per transistor module rating is then 32 Watts, which is feasible but quite challenging. The peak radiant power density at the face of the antenna is 8 W/cm2 which is around twice the cited current state of the art. The HEMTs would have to be state of the art, but basically such peak power performance is pushing against the capacity of the extant cooling system, and achievable transistor performance in efficiency and power output. Claims that the APG-79 can outrange the Irbis E are very difficult to support given basic radar physics. A claim of a tactically significant range advantage over the extant BARS is also hard to support. The corollary of this is that a late model F-35 Joint Strike Fighter APG-81 with similar module count, module power and aperture size to the APG-79 will not provide significantly different performance, relative to the later Russian radars. 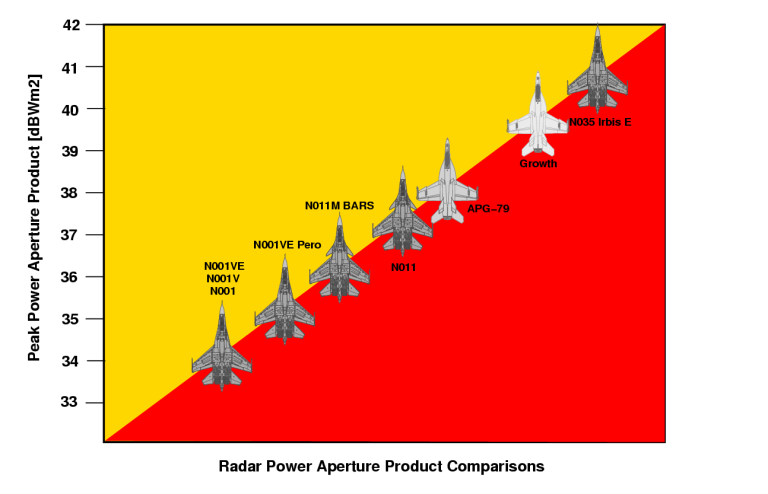 This chart compares graphically the peak power aperture product estimates for the Flanker radars, and the APG-79. The latter is depicted with some provision for growth. 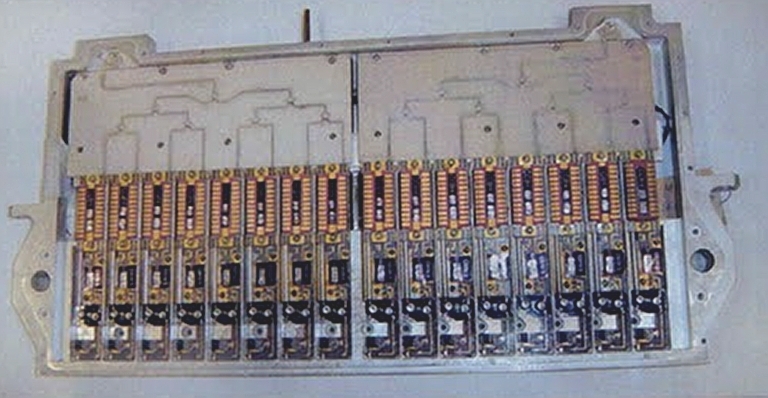 Hybrid array technology used in the BARS and Irbis E provide similar total noise figure for the antenna-receiver design to that of AESA designs like the APG-79. Growth JSF APG-81 radars will be similar to the APG-79. Block upgrades to the BARS to convert it into an Irbis E configuration will not present difficulties as the latter is an uprated derivative of the former. 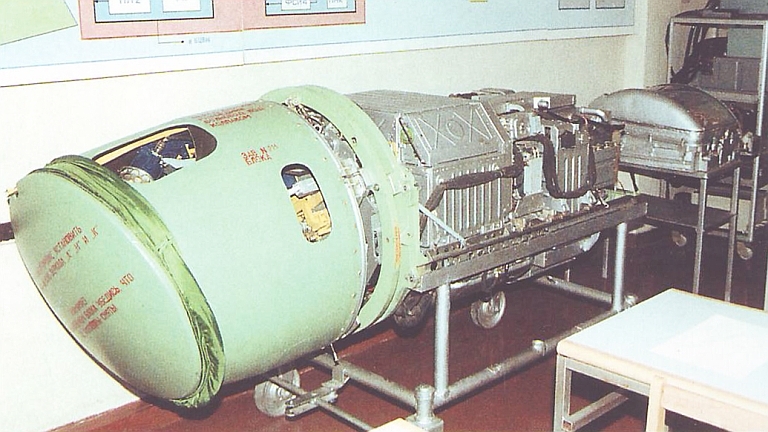 The NIIP N001 was the first radar to be fitted to mass production Su-27 and Su-27S Flankers, during the 1980s. It uses a twisted Cassegrainian antenna arrangement borrowed from the MiG-29's N019 multimode radar. Variants of the N001 remain in production, despite its much inferior performance compared to the N011 series and its later derivatives. The 1980s N001 is the first radar to be fitted to production Flankers. Initially developed with the aim of outperforming the APG-63 in the F-15A/C the developmental design, using a planar array antenna, not perform to expectation and the design was significantly revised, using components from the MiG-29's N019 multimode radar. The antenna arrangement is a much more conventional 1.1 metre diameter twisted Cassegrainian scaled from the N019 but still exploiting the large radome volume to effect. The N001 was during the early 1990s superceded in Russian Air Force production by the N011 planar array design used in the Su-27M. 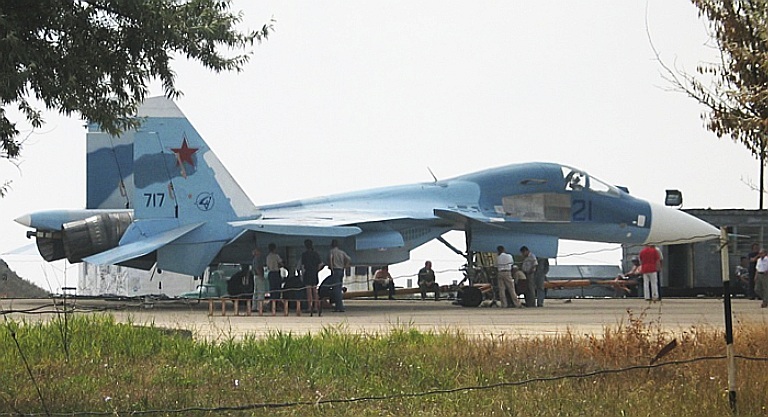 It remained in production for export Su-27SK aircraft delivered to China, Vietnam and other global clientèle's. A series of incremental upgrades have been performed on the N001, primarily to improve reliability and provide additional modes. The N001V/N001VE have improved digital processing, with a Russian Baguette BCVM-486-6 processor, compatibility with the R-77 / RVV-AE Adder BVR missile, and a range of air to surface modes to support multirole operations and air to surface and anti-shipping munitions. The relationship between the N001VE/VEP is not unlike that between the APG-63 on the F-15C and APG-70 on the strike oriented F-15E. Pero space feed ESA - a cheap and simple design with considerable potential. 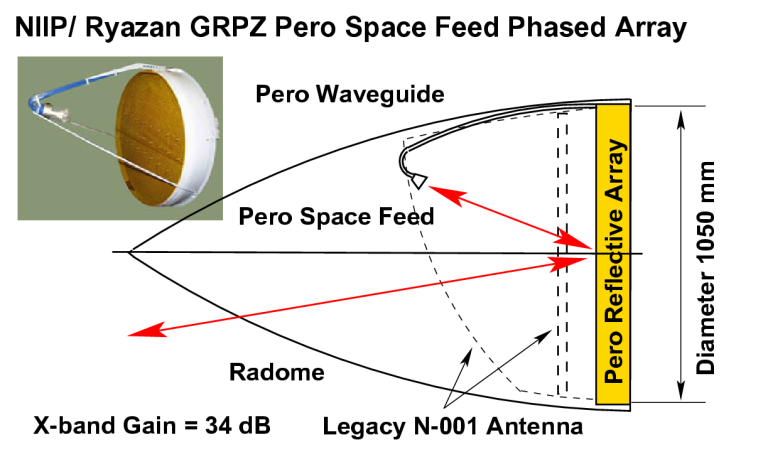 The Pero, developed by NIIP and Ryazan GRPZ, is a reflective space feed passive phased array antenna (PESA), replacing the legacy Cassegrain design. It is lighter than the legacy design, yet offers similar beamsteering agility to the latest Western AESAs. This low cost phased array block upgrade package designated Pero ('Plume'), was designed by NIIP jointly with Ryazan GRPZ. This lightweight design avoids the cost and complexity of the backplane fed BARS (N011M) phased array, instead using a space (optical) feed scheme, and reflective rather than transmissive phase elements, a technique used with the 64N6E Big Bird SAM system radar. The design incorporates the passive phase element array, and a strut supported boom which mounts the X-band waveguide and radiating horn. Cost is comparable to the existing Su-27S/SK Cassegrain antenna, weight is lower. The launch customer was to be the RuAF, but reports indicate one of the two prototypes was sent to China for evaluation. The Pero will provide the beam steering agility of modern Western AESAs, but with lower cost and transmit power ratings, and is likely to appear in regional MLUs later over the coming decade. An open question is whether a future Pero based block upgrade would include the 20 kiloWatt Irbis-E transmitter, as engineering the space feed for a 20 kiloWatt rated transmitter is neither difficult nor expensive. While a 20 kiloWatt Pero system would have inferior receiver sensitivity due to the space feed loss, compared to the BARS hybrid array, it would be significantly cheaper to build and deploy en masse, and likely offer better power aperture product performance due to lower antenna feed losses in the transmit path . The N011 radar was a higher performance replacement for the lacklustre N001 series. It is distinctive by its use of a backplane fed planar array antenna, a design very similar to the US Hughes and Westinghouse APG-6X series radars which emerged during the 1970s and are only now being replaced by newer AESAs. The N011 uses largely digital processing, unlike the hybrid N001 series. 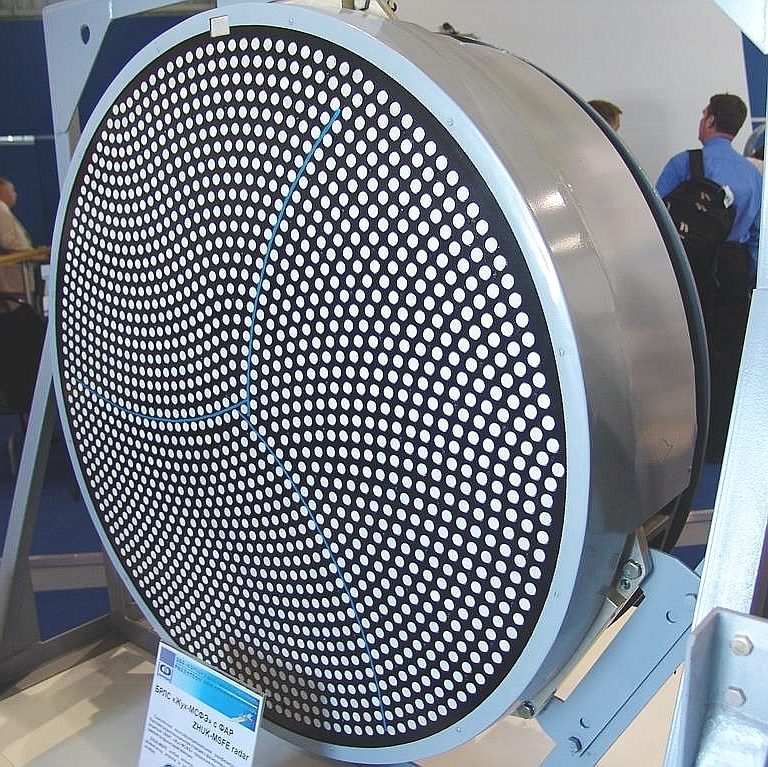 An L-band IFF interrogator antenna array is embedded in the X-band planar array. The N011 was only ever built in modest numbers, to equip the Russian Air Force Su-27K, later renamed Su-35. It most closely compares to the APG-63 and APG-70. By the mid 1990s Russian AF interest shifted to the N011M BARS phased array, trialled in the Su-37 demonstrators. The Zhuk ME is a conventional derivative of the Zhuk M family, available in the 0.7 metre aperture configuration for the MiG-29, or the larger 0.96 metre aperture configuration for the Su-27/30 series. The Zhuk MSE was flight tested and certificated on the Su-30MK3 variant developed for the PLA-AF but to date not ordered. The Zhuk series was developed for the stillborn mid 1980s MiG-29M/MiG-33 Fulcrum upgrade and production effort. Designated the N010 Zhuk, this was a relatively modern pulse Doppler design modelled on the US APG-65 and APG-68 radars, using a slotted planar array antenna with a 0.68 metre diameter aperture, with an average power rating of 1 kW and peak rating of 5 kW. With the end of the Cold War and Phazotron's emergence as an independent entity in an open market, the effort invested into the Zhuk was exploited to develop a family of radars designed for the MiG-29, Su-27/30 and older Soviet era fighters as upgrades. 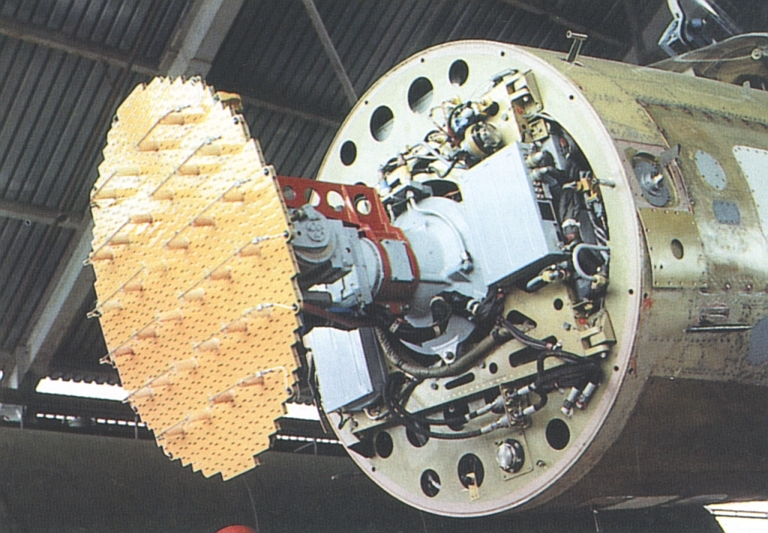 The Zhuk-27 was a variant of the baseline N010 but fitted with a much larger 0.98 metre diameter slotted planar array antenna, and possibly an uprated TWT, intended for the Su-27SK Flanker B. Its contemporary was the Zhuk-8P developed for the PLA-AF J-8-II Finback, with a smaller antenna and thus lower range performance. The baseline mechanically steered Zhuk further evolved, with the N010M Zhuk-M and Zhuk-ME variants for the MiG-29 Fulcrum, and Zhuk-MS and Zhuk-MSE intended for the Su-27/30 Flankers. 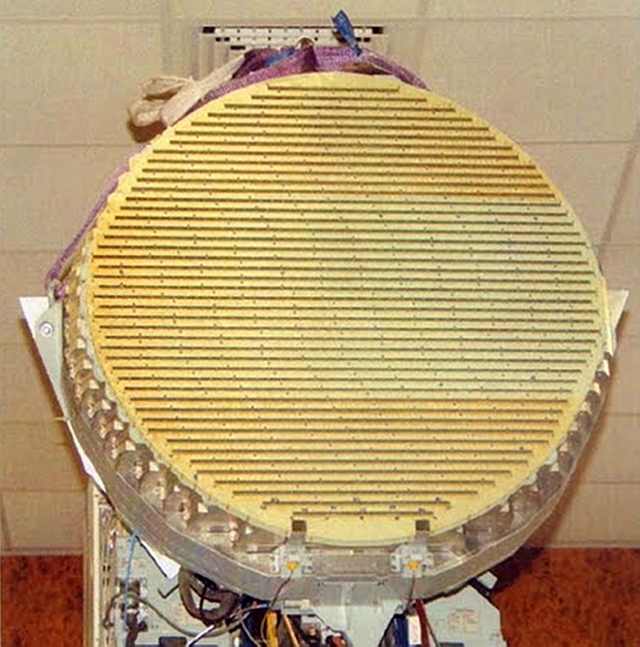 These incorporated an array of L-band IFF dipoles, a slotted planar array, and much improved processor hardware, to support strike modes including Synthetic Aperture Radar imaging. 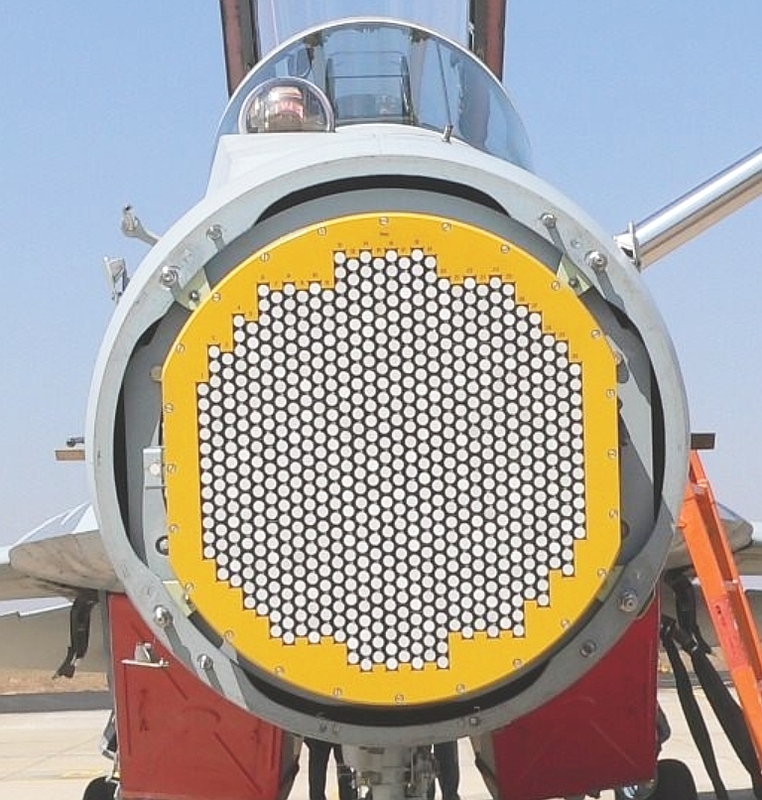 The new slotted planar array radar installed in the Shenyang J-10B Sino-Flanker bears a close resemblance to the Zhuk-MSE and may be a licenced or reverse engineered variant of this design. The Zhuk MSF/MSFE (above) is a passive ESA design intended to compete against the NIIP N011M BARS. It uses a Phazotron unique radial distribution arrangement in the backplane waveguide feed, and proprietary radiating element placement. The Zhuk MSFE has a .98 meter diameter aperture with 1662 radiating elements, and was developed for the Su-30MK3 Flanker G avionic suite intended for the PLA-AF (MAKS 2005). The most advanced of the Phazotron Flanker radars is the Zhuk-MSFE PESA variant, currently being flight tested on the Su-27KUB/Su-33UB side-by-side cockpit navalised Flanker variant, likely to be acquired by the PLA-N as part of their intended carrier airwing for the Varyag CVA. This radar is usually credited with a 2 KW average power rating and 8 kW peak power rating, putting it in the performance class of the NIIP N011 MSA radar on the Su-27K/Su-35 Flanker E. The PESA design has 1662 radiating elements. The Zhuk-MSFE is being flown in an Su-33UB demonstrator, the depicted example (below) with thrust vectoring Al-31FU engines (MAKS 2007). 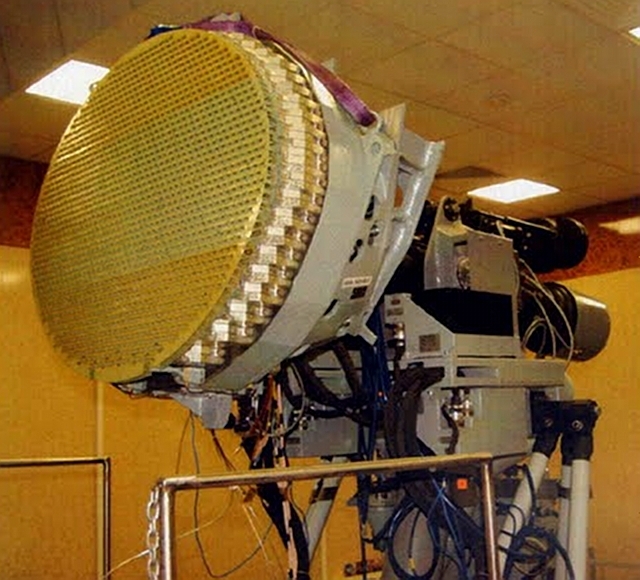 The BARS is the most advanced radar developed by Russian industry during the 1990s. It is unusual in being designed with a hybrid array arrangement, the receive path using very similar technology to US and EU AESAs, with similar sensitivity and sidelobe performance, but using a Travelling Wave Tube and backplane waveguide feed for the transmit direction, a technology closest to the B-1B and early Rafale EA radars. As such the BARS is a transitional design sitting in between Passive ESAs (PESA) and contemporary AESAs. There is no doubt this design strategy reflected the unavailability to Russian designers of the Gallium Arsenide power transistors used in Western AESAs. The baseline N011M radar uses a vertically polarised 0.9 metre diameter aperture hybrid phased array, with individual per element receive path low noise amplifiers delivering a noise figure cited at 3 dB, similar to an AESA. The antenna is constructed using phase shifter and receiver 'stick' modules, a similar technology to early US AESAs. Three receiver channels are used, one presumably for sidelobe blanking and ECCM. The EGSP-6A transmitter uses a single Chelnok Travelling Wave Tube, available in variants with peak power ratings between 4 and 7 kiloWatts, and CW illumination at 1 kW. Cited detection range for a closing target (High PRF) is up to 76 NMI, for a receding target up to 50 NMI. The phased array can electronically steer the mainlobe through +/-70 degrees in azimuth and +/-40 degrees in elevation. The whole array can be further steered mechanically. Polarisation can be switched by 90 degrees for surface search modes. The BARS remains in production for the Indian and Malaysian Irkut built Su-30MKI/MKM variants. The radar is available with a range of TWT power ratings, this being the source of considerable confusion to observers who have not tracked this program since its inception. The result is a wide range of performance figures depending on the resulting Power Aperture Product. That the antenna has good power handling capability is evident in its adaptation for the Irbis E design. Given the similarity between the Irbis E and BARS, existing BARS operators will over time effect block upgrades to convert their BARS inventories into the Irbis E configuration. The follow on to the BARS is the new Irbis-E (Snow Leopard) hybrid phased array, in development since 2004 and planned for the Su-35BM block upgrade, and as a block upgrade or new build radar for other Flanker variants, such as the Su-35-1. It will enter production before the end of this decade. The Irbis-E is a direct evolution of the BARS design, but significantly more powerful. While the hybrid phased array antenna is retained, the noise figure is slightly worse at 3.5 dB, but the receiver has four rather than three discrete channels. The biggest change is in the EGSP-27 transmitter, where the single 7 kiloWatt peak power rated Chelnok TWT is replaced with a pair of 10 kiloWatt peak power rated Chelnok tubes, ganged to provide a total peak power rating of 20 kiloWatts. The radar is cited at an average power rating of 5 kiloWatts, with 2 kiloWatts CW rating for illumination. NIIP claim twice the bandwidth and improved frequency agility over the BARS, and better ECCM capability. The Irbis-E has new Solo-35.01 digital signal processor hardware and Solo-35.02 data processor, but retains receiver hardware, the master oscillator and exciter of the BARS. A prototype has been in flight test since late 2005. Parametric analysis indicates the performance for the N011M BARS is cited for a low TWT power rated variant. The MiG-35 Zhuk AE AESA designed by Phazotron is the first Russian AESA design and is expected to spawn upgrade packages for Flanker variants, as Phazotron have been trying for over ten years to break NIIP's defacto monopoly on Flanker radars. Its most likely competitor will be a derivative of NIIP's AESA design developed for the PAK-FA. Russian industry crossed an important milestone with the 2007 unveiling of Phazotron's Zhuk AE AESA radar for the MiG-35. In August, 2009, Tikhomirov NIIP were cleared to publicly display the new AESA developed for the PAK-FA, and also a clear candidate for Flanker retrofits. Until recently, the principal impediment to the introduction of AESAs has been the unavailability of good Gallium Arsenide technology power transistors for use in AESA Transmit Receive modules. While global commercial GaAs production is of the order of 100 times greater in volume compared to military production in the West, there has been only modest non-military demand for this class of transistor to date. That is changing now with the US breakthrough earlier this decade in Gallium Nitride transistors, now appearing in second generation US AESAs, as these have been identified as an enabling technology for WiMax broadband networking. As result the coming decade will see such devices mass produced for commercial users, making their export to Russian defence industry impossible to control. We are already observing Japanese manufacturers producing GaN transistors rated at 50 Watts in the X-band. The commodification of high performance 32-bit and 64-bit microprocessor chips is the applicable case study, since these are now appearing in a wide range of Russian military equipment designs. The principal challenges Western designers have faced in AESAs have fallen into both antenna design, and integration. AESAs typically use A-class amplifiers to provide bandwidth and frequency agility, and the high linearity and low distortion required for sophisticated waveforms. The result is considerable power dissipation in the antenna, which is typically dealt with by liquid cooling using Poly-Alpha-Olefin (PAO) coolant. Some designs, such as the F-22A and F-16/B60, dump heat into the aircraft's fuel as a thermal buffer, and then dissipate it. Some designs will directly dump the heat into a heat exchanger. Integration of an AESA into the Flanker airframe will not present difficulties, as there is considerable internal volume, large internal fuel capacity with potentially large cooling capacity, and electrical power to spare with the newer engine designs. 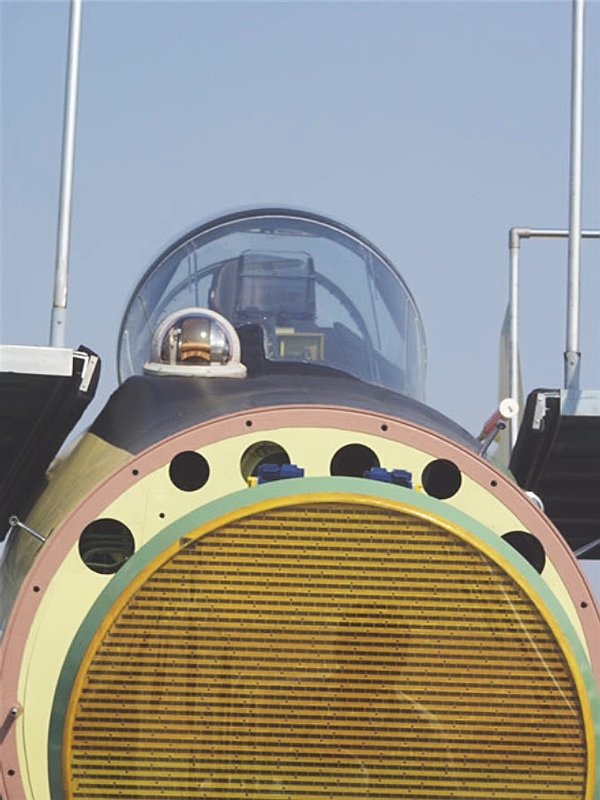 The large 0.9-1.1 metre diameter aperture provided by the nose and radome design will be especially attractive to an AESA designer. 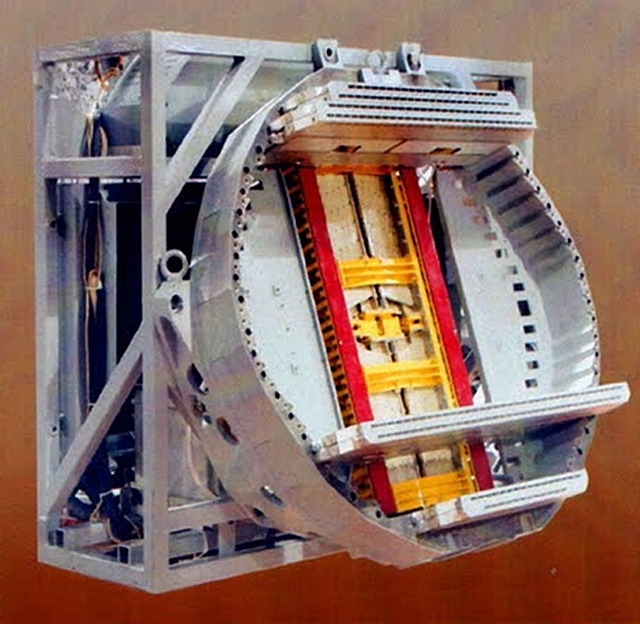 This aperture size permits around twice as many AESA modules of similar size to most current Western designs, apart from the F-22A Raptor APG-77 and F-15C APG-63(V)3/4, to be packed into the antenna. The implications of this are sobering, insofar as with modules rated at half the peak power of the current state-of-the-art, such a radar could provide about the same peak power rating as current top end US AESAs. The Power Aperture Product would thus be higher due to the aperture area being so much larger. With COTS derived modules of much higher peak power rating than current US military GaN HEMT technology, a future Flanker AESA could have a very much higher Power Aperture Product figure, with significant counter-stealth potential. In 2009 there were two principal candidate AESAs for installation in new build Flankers, or retrofit into existing service Flankers. 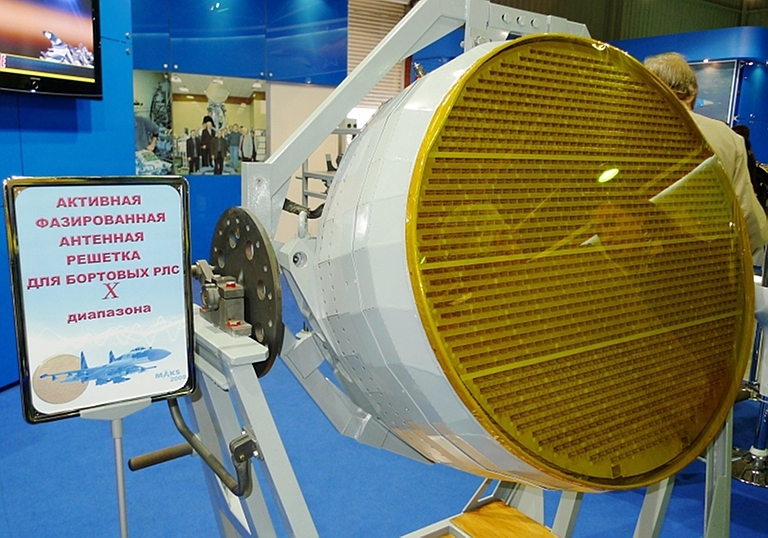 These radars are NIIR Phazotron's intended Zhuk-AS/ASE, scaled up from the MiG-35 Zhuk AE AESA, and a derivative of Tikhomirov NIIP's new PAK-FA AESA, displayed publicly at MAKS 2009. Both radar designs are based on the quad channel TR module technology first disclosed during the public release of the Zhuk AE. These X-band modules are now being mass produced on an automated line by NPP Istok, who are also planning S-band module production. Mostly Russian produced GaAs components are employed. Cited capacity is sufficient for 50 AESA radars annually. Other than a stated intent by NIIR Phazotron to scale up the Zhuk AE, there are no technical details of this design available at this time. In a sense it is an analogue of the Raytheon scaling of the APG-79 AESA for the APG-63(V)3/4 upgrade (refer below). Estimated detection range chart for variants of a Flanker sized AESA equipped with a range of Transmit Receive Module power ratings per channel. 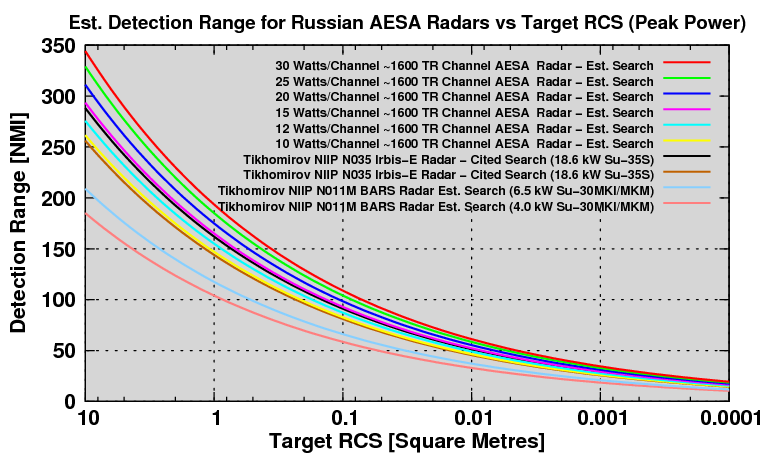 The detection range performance of the 10 and 12 Watt module equipped AESA is similar to the Tikhomirov NIIP Irbis-E hybrid ESA in the Su-35S, and much superior to the N011M BARS. The performance of AESA if equipped with modules rated above 15 Watts is superior to the Irbis E. Receiver noise figure and effective aperture area are assumed to be similar. N011M performance is based on parametric data and is better than NIIP cited figures (Author, 2008). Modelling performed by APA in 2008, making some reasonable assumptions, such as an element count of ~1600 for the antenna provides a good baseline for a Zhuk AS/ASE as well as the PAK-FA AESA. This is detailed under the Zhuk AS/ASE analysis of 2008. NIIP AESA on display at MAKS 2009 (© 2009, Miroslav Gyűrösi). The Tikhomirov NIIP AESA design for the PAK-FA is better understood. The antenna aperture is very similar in size, if not identical, to the aperture of the Irbis E. The design is intended for fixed low signature tilted installation, rather than gimballed installation, and auxiliary cheek arrays are planned for. The design is claimed to have been integrated with an existing BARS/Irbis radar for testing and design validation purposes. Public statements made in Russia claim 1,500 TR module elements. Counting exposed radiating elements on video stills of the antenna indicates an estimated 1,524 TR channels, with a tolerance of several percent. This is within 5% of the 2008 APA model for a Flanker AESA. NIIP have publicly cited detection range performance of 350 to 400 km (190 to 215 NMI), which assuming a Russian industry standard 2.5m2 target, is consistent with the 2008 APA model for a radar using ~10W rated TR modules, which in turn is the power rating for the modules used in the Zhuk AE prototypes. This puts the nett peak power at ~15 kiloWatts, slightly below the Irbis E, but even a very modest 25% increase in TR module output rating would overcome this. 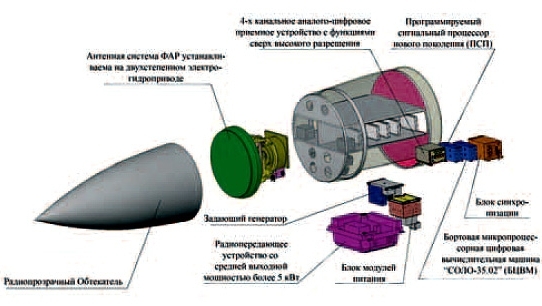 To drive down the cost of this AESA, the best strategy available to the Russians is the export of AESA upgrades to the global community of Flanker users over the coming decade, emulating the US approach with this technology. Tikhomirov NIIP brochures state that the existing AESA would be the basis of AESA upgrade designs for the Su-27/30/35 Flankers. Recent reports from India suggest that 100 Su-30MKI Flanker H may be retrofitted with AESA upgrades to their N011M BARS radars post 2015. It is now inevitable that AESAs will appear on Flankers, the only uncertainties at this stage will be in the number of aircraft retrofitted, the clientele, and exact timelines and performance specifications of these radars. 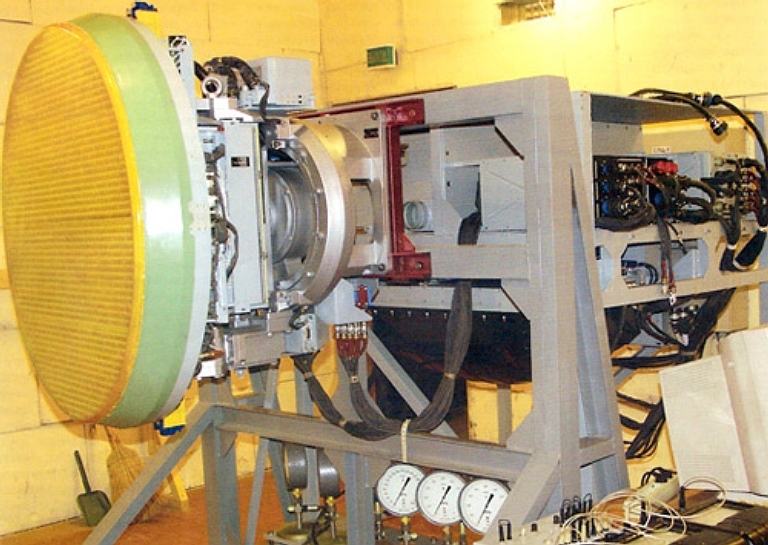 Instrumented AESA prototype (Tikhomirov NIIP). AESA antenna mounting. This example is constructed using TR module sticks, using an arrangement similar to the BARS and Irbis E, including the slot radiators. 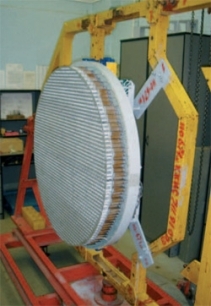 This brochure image may be of a developmental antenna, as the example presented in the Vesti video uses the same style of circular dielectric radiator as the competing Zhuk AE/ASE series (Tikhomirov NIIP). TR Module stick. Of particular interest is that the feed networks are symmetrically split, permitting this design to produce dual plane monopulse sum and difference outputs from a stack of such sticks (Tikhomirov NIIP). Raytheon's APG-63(V)3 is an AESA block upgrade to the legacy APG-63 radar on the F-15C/E variants, based on APG-79 module technology. It is to be supplied on the Singaporean F-15SG and retrofitted to some USAF F-15s. The APG-63(V)3 upgrade path represents the likely model that will be adopted for AESA mid life upgrades on Flankers, as it is a self funding mechanism to drive down mass production costs of AESA modules (Raytheon images). This video footage shows the first public disclosure of the NIIP PAK-FA AESA design. There are numerous reports of PLA dissatisfaction with the N001 series radars, supported by reports of the Pero demonstrator sale to China. This presents the likely outcome of the PLA-AF acquiring the Irbis E equipped Su-35, but also performing block upgrades to the extant Su-27SK/SMK and Su-30MKK fleets as immediate force structure expansion costs taper off after 2010. Refer C Kopp, Considerations on the use of airborne X-band radar as a microwave directed-energy weapon, Journal of Battlefield Technology, vol 10, issue 3, Argos Press Pty Ltd, Australia, pp. 19-25. A major factor is the achievable performance of the HEMT transistors installed in the AESA Transmit Receive modules, ie their X-band power rating in Watts, and their Power Added Efficiency (PAE) in percent, the latter a measure of excess waste heat dissipation in the modules. The high bandwidth and linearity demands imposed on military AESAs generally force the use of A-class amplifier designs, which are profligate consumers of electrical power and thus heat dissipators, regardless of clever power management techniques. The current state of the art in X-band HEMT transistors and MMIC (Monolithic Microwave Integrated Circuits) sees PAE values ranging from 25% to the the nominal 45% up to almost 70% in pulsed modes, and power ratings from single Watts up to a staggering 80 Watts per transistor reported in an academic journal (Toshiba). No matter how good the transistor might be, the hard limits on average and thus total power will be set by the capacity of the liquid cooling system. Chinese interest in the Pero may well be driven by an imperative to increase capability at minimum cost. While it is known that NIIP have tried to market the BARS for block upgrades, reports indicate a reluctance on the part of the PLA to embrace a system which is identical to what the Indians are using. A Pero block upgrade with a strongly uprated transmitter is the cheapest path for the PLA to match or exceed the PA of the BARS. LCDR Nate “Hyber” Marler, Advanced Weapons Lab, VX-31,China Lake, Ca, Risk Management Lessons Learned from the APG –79 Radar Test Planning and Execution (PDF). Skolnik M.I. (Editor), Radar Handbook 3rd Edition, 007057913X, McGraw-Hill, February, 2008 (highly recommended - esp. Ch.5).